Current economic growth remains strong. Nearly all leading indicators are flashing green, signaling solid gains in the near-term. However, the economy is set to slow moving forward for a number of reasons. First, growth must slow to a more sustainable rate. As the U.S. and Oregon reach full employment, supply side constraints will work to slow growth. These include a tight labor market, infrastructure, higher energy costs, capacity utilization and the like. Such hurdles to growth do not prevent firms from expanding and propelling the economy, but they do require time, plans, and money to overcome. The low-hanging fruit of growth is gone in a mature expansion. Furthermore, uncertainty surrounding the economic outlook increases over the course of the upcoming 2019-21 biennium. The primary drivers of uncertainty relate to federal policies and the magnitude of their impact on the economy. As the tax cuts and spending increases play out at the federal level, fiscal policy will turn from a driver to a drag on growth in 2020. Similarly, monetary policy will have transitioned from accommodative to neutral, and likely even restrictive in a couple of years. The full impact of the Federal Reserve’s rate hikes that began in late 2015 will be working to slow the economy. Between today and the next recession, whenever it may come, the Oregon economy will continue to hit the sweet spot. The strong labor market is driving employment rates higher and poverty rates lower for all ages and racial and ethnic groups across the state. One result is household incomes are reaching historic highs on an inflation-adjusted basis. The feel good part of the economy is clearly here. 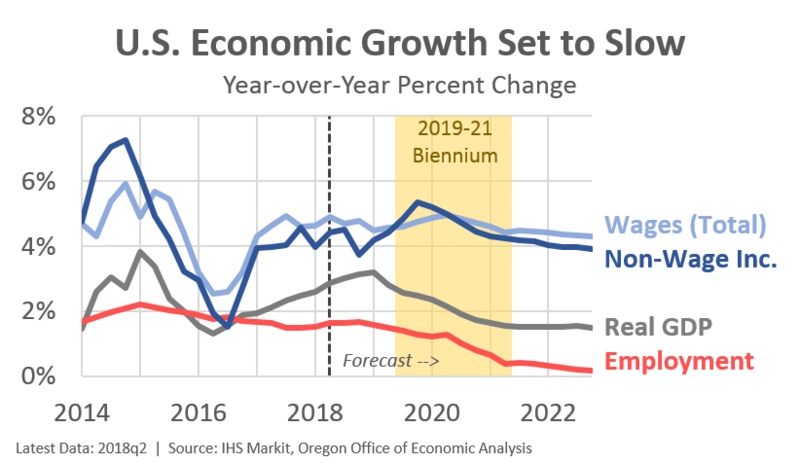 Oregon’s economic outlook faces significant uncertainty a couple of years down the road, but there is relatively little risk to the outlook over the remainder of the current biennium. The same cannot be said for Oregon’s state revenue forecast, which faces a tremendous amount of uncertainty in the near term. Thus far during the 2017-19 biennium, growth in Oregon’s major revenue sources has been consistently stronger than gains in the underlying economy would suggest. Much of the strong revenue growth can be traced to temporary factors, including the response of Oregonians to federal tax law changes. State tax liability has been boosted somewhat due to the federal reforms, but recent payments have been larger than what could reasonably be expected due to the direct impact of the law changes. It is likely that collections will cool down going forward as households and businesses reconcile their annual tax bills. 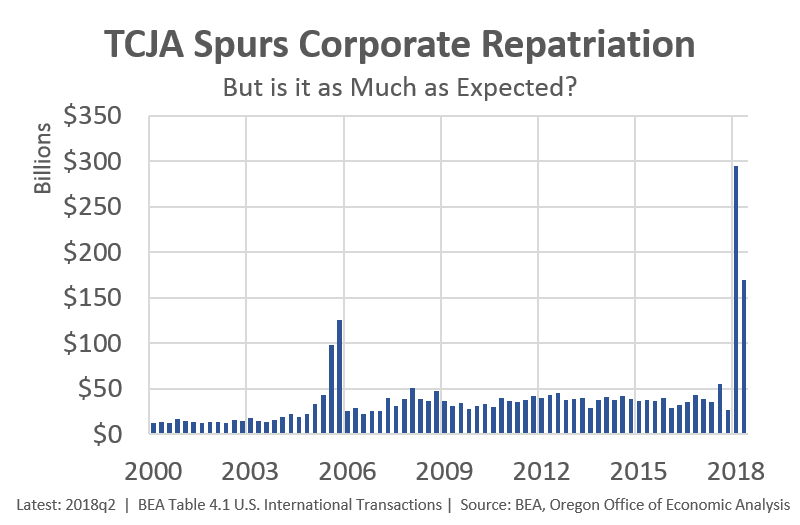 One facet of the federal tax reform that has become clearer in recent weeks is the impact of repatriated foreign earnings. While a significant amount of repatriation is occurring, initial estimates of the flow are proving to be too large, and have been revised downward. Given the large degree of uncertainty surrounding this one-time revenue boost, policymakers in Oregon channeled corporate taxes associated with repatriation outside of the General Fund, with most going to reduce unfunded pension liabilities for school districts. These funds will be pulled out of the revenue stream during the next biennium. The newly lowered estimates imply less will be pulled out next biennium. Also, since most repatriated profits are returned to shareholders in the form of stock buybacks and dividends, personal income tax collections have been revised downward as well. Heading into the next biennium, uncertainty about the performance of the regional economy will become paramount. Growth will certainly slow to a sustainable rate in the coming years, but the path taken is unknown. Capacity constraints, an aging workforce, monetary policy drags and fading fiscal stimulus will all act to put a lid on growth a couple of years down the road. However, the exact timing and steepness of this deceleration is difficult to predict, leading to a wide range of possible revenue outcomes for the 2019-21 budget period.